Recovery Mode is a panel designed for retrieving the HCL operating system in case of technical problems, e.g. when it is not possible to log into the user’s panel. Using recovery mode the Home Center Lite will be brought back to the factory installed firmware version. That means all of your settings, configured devices, rooms and so on will be removed and lost if not backed up. Once back up and running, you will be able to upgrade the firmware to the latest version. Make sure you have a backup available to suit either the recovery firmware version or the latest firmware version if you don’t want to lose all of your data! Press and hold two buttons at the same time: Power and Recovery. Release the buttons when the LED diodes start moving in a sequence. Entering into Recovery mode is signalled by the LED diodes moving to the middle and back. Don’t hold the Recovery button for too long! If you hold the Recovery button for 10 seconds the Home Center IP will be set to 192.168.81.1 and you’ll need to adjust the network settings on your computer in order to access the device. Type in the IP address of Home Center Lite in your web browser or use Fibaro Finder. 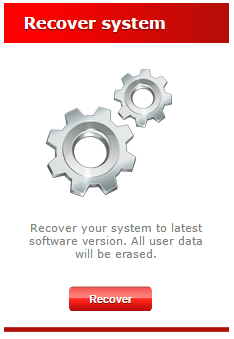 Click the Recover button in order to restore the Home Center to factory firmware version. Recovery panel will ask you to confirm your choice. Recovering process will start automatically. After successful reboot you can access the Login Panel. Remember that login and password will be set back to admin / admin and that the HCL needs updating the firmware.